Rogers/Fido have introduced a new data service for its existing customers called the “Data Day Pass”. The new data service is not applicable to current data plan holders, but is instead targeted at customers that do not have any kind of data/mobile Internet plan. The Data Day Pass is a service that provides data (Internet) to Rogers/Fido customers that do not currently have a data plan. 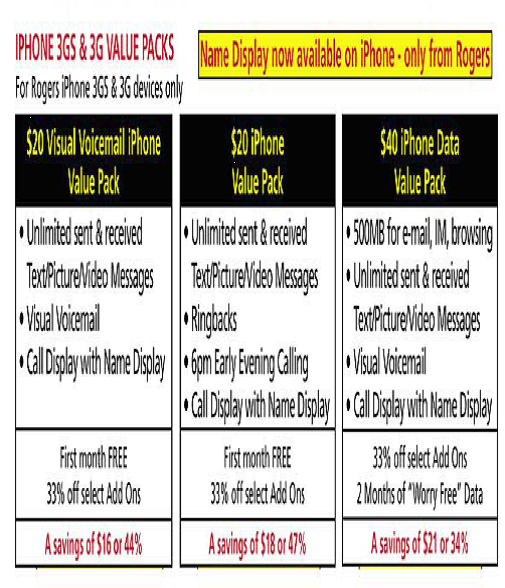 For $2.99/day, iPhone customers may use 20MB of data for anything they want on the web ($1.00/day for unlimited mobile browsing for consumer phones; $4.99/day for 50MB for access cards/Internet sticks). That’s right, TWENTY (20) MB. As you can probably guess, 20MB is NOT a lot of data to do anything. Rogers/Fido have some great data usage numbers to show you what you can do with 20MB but 20MB is really only a couple minutes, maybe seconds, of YouTube or GPS Maps. The service does not support Tethering or Roaming, but really, that goes without saying as anyone who is attempting to Tether or Roam with only 20MB of data from Rogers/Fido should think twice. 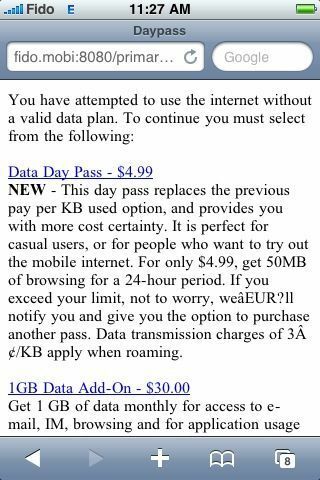 The service was introduced to do away with the current system of paying for data by KB and instead charges a flat fee of $2.99 for 20MB of data. Notice the use of the word AND and not OR. 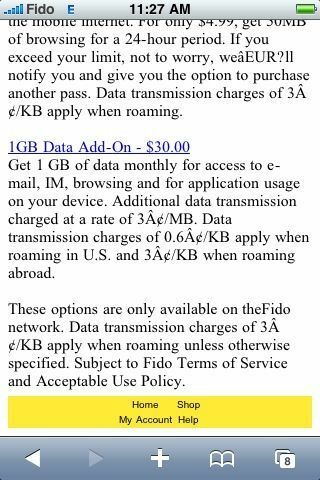 I guess that Rogers/Fido estimate could be correct if the emails have only text, the IM’s are short, and the web pages are just full of text with no images at all. If anyone would like to test the estimate, please do*. In order to subscribe to the Data Day Pass, you must not already have an existing Data plan of any kind or any kind of data blocks on your account. Once the 24 hour day pass expires or the customer uses up all of their 20MB, the customer will be prompted to purchase another Data Day Pass if their first day pass expired during a data session or when the customer attempts to use another Internet app. And that is The Data Day Pass. I am not sure how I feel about this service just yet, as it is clearly more economical to just get a monthly data plan, whether by contract or not. What do you think? Is the Data Day Pass for you?